… This is the first time in NFL history where we have 4 games featuring teams 6-3 or better matching up head to head. Of these teams ([email protected], [email protected], [email protected], [email protected]), the only game featuring a team who is not slated to make the playoffs is the Packers. Fortunately for the Packers, they are at home, but they need to win or hope the Lions and Seahawks both lose so they are still in striking distance. 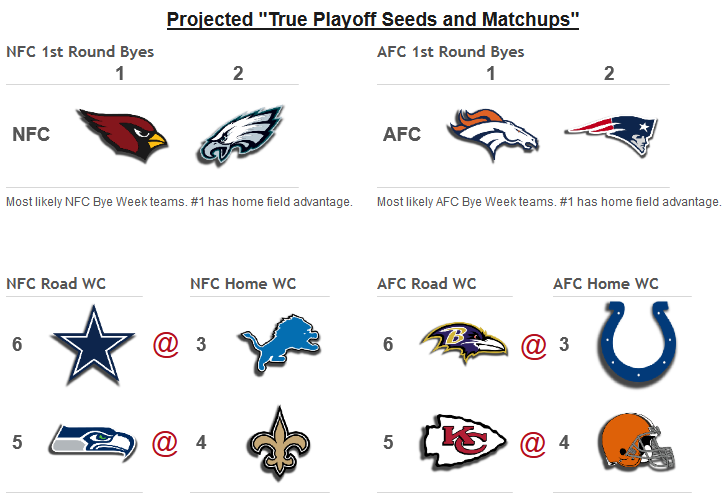 … Speaking of the Seahawks, according to the currently projected playoff seeds from NFLproject.com, the two top 5 seeds (the best non-division winners) both meet head to head in Kansas City for a HUGE game. What I want to see is whether or not the Chiefs can execute the proper strategy to beat the Seahawks, which is to sprinkle in some shots to WRs down field. The Chiefs NEVER pass to WRs down field, nor do any WRs have a TD reception. Meanwhile, either the confidence in Russell Wilson is slipping or he simply does not have the weapons, but the Seahawks are relying a lot on the run. The Chiefs bring the 21st rated run efficiency defense to the table. So that defense is going to have to step up. It certainly will be the most “pivital” early 1pm ET game. … How the Bears respond to all the turmoil they’ve put themselves in with their 3 straight losses, including the humiliating 55-14 loss to the division rival Packers. To be fair to the Bears, they have played the Dolphins, Patriots and Packers the last 3 weeks, and two of those games were on the road. Those teams are all solid, winning teams. The last 5 years, only 3 sub-.500 teams lost on the road by 4 TDs and came home as short favs. They went 1-2 SU and 0-3 ATS. In prior years, teams responded well, but not recently. I’m curious if this one time playoff contender brings it or fails to show up. … How does Mark Sanchez look in his 2nd start, this time against a much more aggressive (defensively AND offensively) foe like the Packers. I am going to share some fascinating analysis on this game with clients today, but I cannot wait to see Sanchez and this offense perform and then Aaron Rodgers step on the field as soon as the Eagles offense is done. … How the Cincinnati Bengals respond off of the humiliating and playoff-hope-devastating loss to the Browns last week. Andy Dalton looked miserable. Will this trend factor into the final result? -> teams who lost by over 7 points in a home Thursday game and are now on the road as dogs of between 3 and 13 are 0-11 SU and 2-9 ATS. … Andy Dalton look terrible vs the Saints defense. Dalton literally passed for 2.0 yards/pass. I’m not sure how that is even possible for a $100M quarterback in 39 pass attempts, but he pulled it off. The Saints pass defense is not very good, and if the Bengals drop this game to the Saints (which they are projected to do), they can likely count themselves out of the playoffs this year. It will be too bad, as we all were looking to see them drop another home playoff game. … The 49ers not feed Frank Gore and the stable of RBs from San Francisco a la what the Seahawks did last week. The Giants have arguably the worst defense in the NFL. Last week they gave up 350 rushing yards on 45 carries! That’s 7.8 yds/carry. To put that into perspective: only 5 QBs last week passed for more yds/attempt than what the Seahawks gained when handing the ball off 5 yards behind the line of scrimmage! … The Chargers struggle with the Raiders. A few weeks ago, San Diego barely beat the Raiders, 31-28. The Chargers were a team who started 5-1, dominated the Seahawks, and looked to be on their way to the playoffs again this year. Instead, they dropped 3 straight. Like the Bears, you cut them some slack for losing to the Chiefs, Broncos and Dolphins, but they loked terrible in the last two losses. They have 2 straight home games, vs OAK and STL, to “get right” before facing the gauntlet of: BAL, NE, DEN, SF and KC. Likely, they won’t make the playoffs. But this team NEEDS to win this week and next week for their confidence, heading into that insane close to the season. … Andrew Luck has never beaten Tom Brady, but teams off of back to back wins who head to Indy to face Luck have never walked away with a win. They are 0-4 SU/ATS. Something has to give and it should make for a memorable Sunday night game. … Since Marc Trestman came to town to coach the Chicago Bears, when playing in Chicago, opponents are 8-0-2 ATS on non-MNF primetime games. .. The largest EDSR (Early Down Success Rate) edge this week is the Redskins over the Buccaneers. Washington is 7th offensively and defensively, while the Bucs are 17th offensively and 29th defensively. But the fact they have played the league’s 2nd easiest schedule of opposing defenses does not reflect well on the offense. … The largest “30-&-In” advantage is the very same matchup. So instead, I’ll mention that the largest red zone edge is the Browns over the Texans. Cleveland ranks 7th offensively and 1st defensively while the Texans rank 20th offensively and 21st defensively. … Click HERE for the free recommendation this week! GOOD LUCK on this 11th Sunday of the NFL Season! A weekly look at uncovering value in the NFL thru the use of advanced metrics and quantitative analysis. Immediately below this is the Weekly “NFL Cheatsheet” – things I referenced in my podcast above, and all the data for ALL the teams. Available only to Season Clients or Weekly Clients.